1 How did the site start? 4 Is it really fat-free? 8 Cheap Air Fryers – Are they worth it? I decided to start this site after my first low fat fryer purchase was a disaster. I bought based on price and price only (it was less than £40). The unbranded model I chose only last for 2 months before malfunctioning and the high street shop I bought from had closed down so had no way of getting a refund. Not wanting to make the same mistake again, I decided to research the best health fryers for sale and write detailed reviews about them here. Cooking with a healthy frying machine has transformed my diet for the better. I’ve lost 2 stones and eat a more balanced diet, thanks to the versatility they offer. 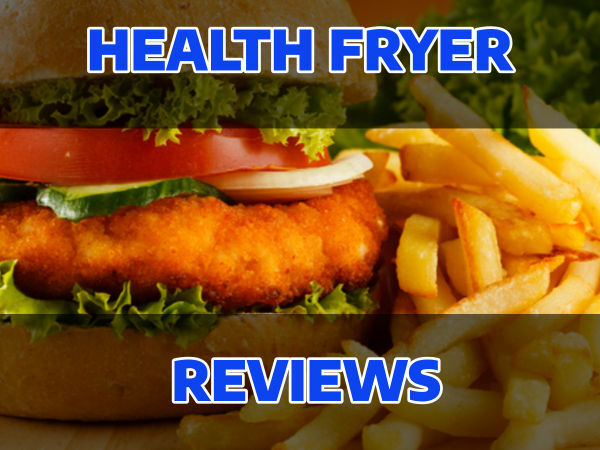 I manage this site with my husband Jeff and together bring you the latest low fat fryer reviews. Hot air cooking has never been so much fun! These frying machines without oil means you’re consuming fewer calories whilst cooking great tasting food. Health fryers are also known as dry fryers, but on this site we refer to them as air or health fryers. 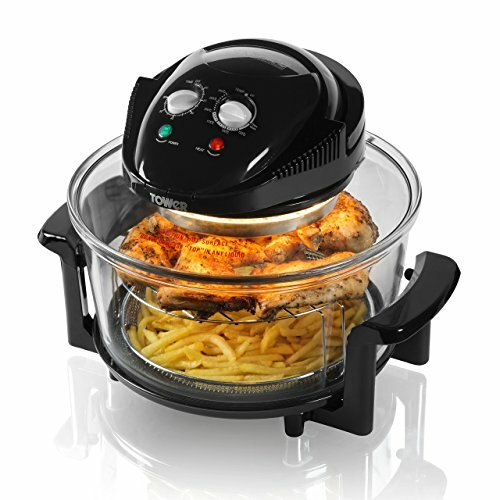 Have a browse around and compare air fryers currently available to buy and choose the one for you. This site is dedicated to bringing you the very latest reviews of low fat and oil free fryers and halogen ovens for 2019. We’ll help you make an informed choice of which healthy cooking appliance will suit your needs and budget. Healthy cooking doesn’t have to mean cutting out your favourite fried food. Low Fat cooking uses minimal to no oil meaning the same great taste but without the high levels of saturated fat. We’ve gone out into the market and picked our top ten products to present to you with a full review, containing the good, the not so good bits about each one. Having saved your hard earned money, you want to be sure which appliance will suit your needs best. With more and more consumers becoming health conscious, it’s no surprise that low fat fryers was the top selling kitchen appliance in 2014 and their popularity will sure continue in 2019. This is good news for the consumer as manufacturers will continue to invest into product development giving you, the consumers plenty of choice. That’s why we started this site, to guide and assist you to make the right choice of health cooker. No, not exactly. Air fryers still have to use some oil/fat to help cook the food, but due to the nature of how air fryers work, much less oil is needed than other forms of frying. Instead of fat-free, we like to use the term low fat. In the table above are our current top picks for low fat cooking in your kitchen. Our readers tell us having the products all in one place to review is a great help when choosing which product to buy so if you’re new to this site, we hope you find this too. Below is our mini reviews section, which gives you an overview of each low fat fryer or oven. We’ll be adding more detailed reviews for those who require more information to make their informed choice, but you’ll notice the buttons to go through to Amazon.co.uk should you be ready to complete your purchase. 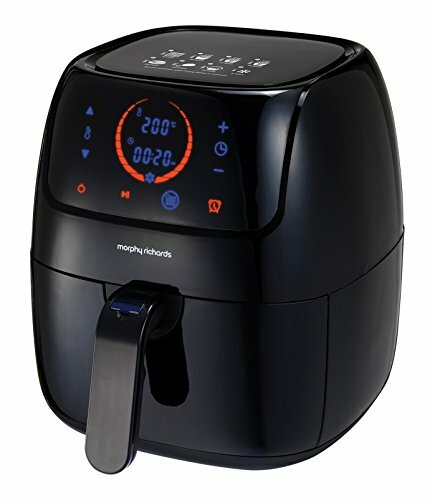 Cheap Air Fryers – Are they worth it? 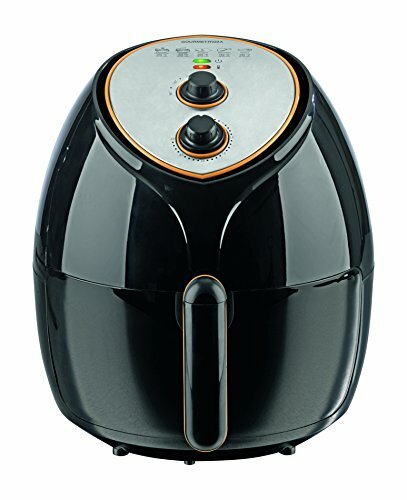 Like most household appliances, there are air fryer models for all budgets but are the cheaper models any better than the more expensive ones? What we generally find is the cheaper models are smaller in capacity (fine if you’re only cooking for one) and have more basic analogue controls. The quality of materials was noticeable too, such as cooking basket and outer casings. The more expensive premium models have detachable pan handes which makes it easier to store away or clean. In the reviews below, we indicate the price range for each health fryer. As prices change often, it’s best to click through to Amazon for the latest price. Our #1 fryer choice for 2019 is the Halo Plus from Breville; the successor to the original Halo and now comes with a faster cooking time – 28% to be exact over the previous model. We all love time savers in the kitchen so this was a major contributing factor to making this our top choice. It’s no surprise to see Breville near the top of our list; they are a leading brand of domestic and kitchen appliances in the United Kingdom and Amazon have made a good decision in stocking Breville products in their range. 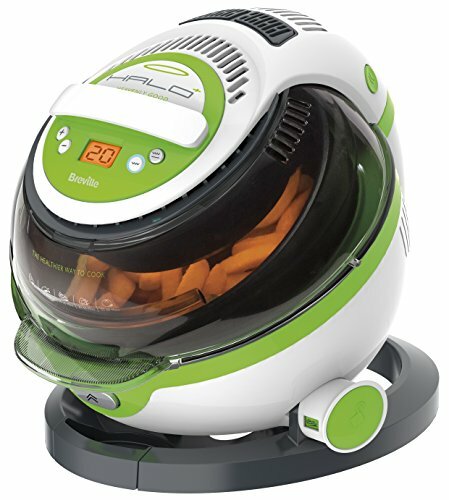 The Halo Plus comes with a dual heat source, meaning instant heat but at the same time, the fan assisted heat source ensures food is thoroughly cooked through. It’s a versatile addition to any kitchen giving you the ability to fry, bake, sauté and roast your food. If you hate washing up, then you’ll be pleased to hear it comes with a dishwasher safe bowl. The bowl can hold up to 1Kg of chips, plenty to feed a family. Whilst the colour scheme of the Halo Plus won’t suit all tastes, we suggest that doesn’t put you offer buying this feature rich model as it provides great value. 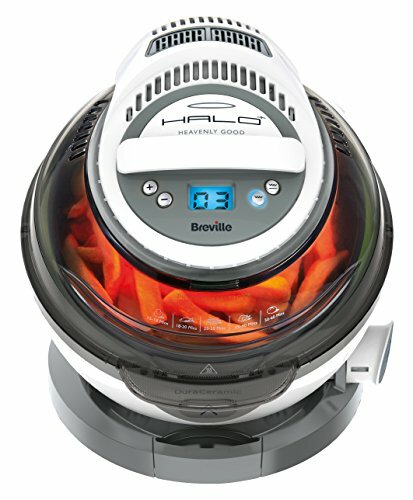 Read our full review of the Breville Halo Plus here. If you like to see your food as it cooks then the T14001 is the one for you. Not only is it priced very competitively, it’s packed with a range of features, including cook from frozen mode. This fryer is our budget range and this is partly because it doesn’t have all of the features that you’d expect from the more premium models. One example of this is that there is no rotating paddle so you have to turn the food yourself for best results. That said, this is currently retailing at half the manufacturers recommended retail price so if you’re on a budget, this model is ideal. It has a 17 litre capacity which will suit most household requirements. There are two racks with this model so you can cook different foods at the same time. e.g chicken and chips. Cleaning up is made is made easier with the built-in self clean function, which removes any build up grease and oil from the bowl. With easy carry handles on either side, the Tower T140001 AirWave is our #4 choice. Read our full review of the T14001 here. Once again we have another Tefal cooker in our review line up and this is the baby brother of our #3 choice. 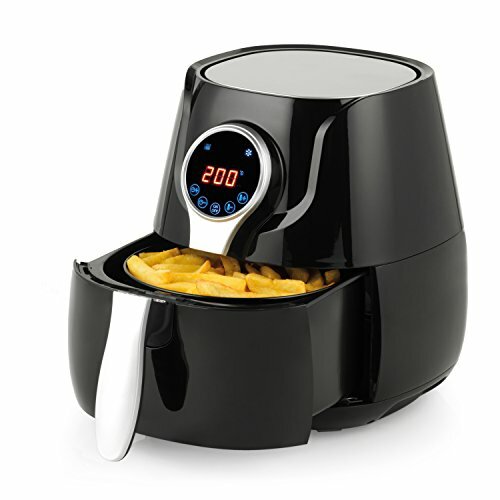 This 1kg low fat fryer uses Tefal’s patented hot air system and stirring paddle for evenly cooked food. Not only is this hands-free cooking, it also means less of your time spent tending to your cooking. Set and forget! There are four main removable parts to this model – spoon (for the oil), bowl with handle, paddle and lid – all of which can be washed in a dishwasher for added convenience. A neat feature of this Tefal model is the pause function, allowing you to halt the cooking cycle while you add seasoning, or other items to cook for example. The cooking cycle is instantly resumed the moment you close the lid. The removable bowl is non-stick and is ceramic coated for easy cleaning. If you’re new to low fat cooking, this model also comes with a free recipe booklet, but Tefal have taken this further with a downloadable app for additional meal ideas and tips. The timer on this model is digital and there is an audible alert at the end of the cooking cycle. The stylish black finish will look at home in most kitchens. Read our full review of the Tefal ActiFry here. As with other models in our line up, the Duronic AF1/B is a closed cooking system that provides an odourless and splatter free cooking experience. It has a cool exterior so if safety is a concern (e.g children in the home) then this will be an important buying consideration. There’s an adjustable cooking temperature control and it also comes with a free recipe book to get you started with this type of cooking. Example of recipes included are for chips, chicken wings, fried cod, samosas and lamb chop among several others. In terms of power, it is rated at 1500W which is slightly higher than most other models on the market. It has a black exterior with a white and silver handle and has a 2 year warranty. Both the bowl and basket are dishwasher safe, so no washing up afterwards. This is one of the more compact units we’ve reviewed and can easily fit on the kitchen counter or stored away if needed. Let every day meals become easier to cook with the Duronic AF1/B. Read our full review of the Duronic AF1/B here. 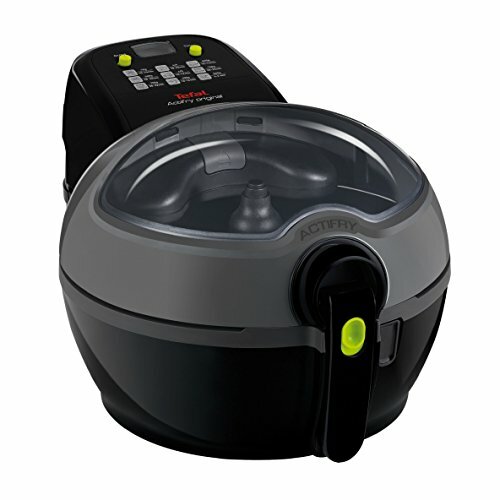 Tefal have the taken the ActiFry one step further with this 2 in 1 model, with the inclusion of a cooking plate above the bowl assembly, meaning there are more variations to cook a complete meal from just one appliance. 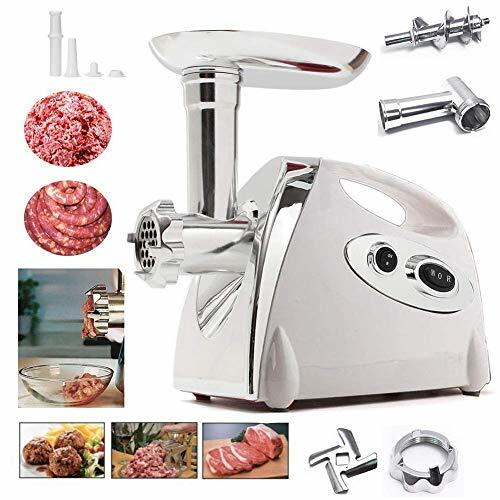 The top plate rotates so whether it’s chicken, fish or sausages you’re preparing, they will be cooked through while the bottom bowl cooks your the rest of your meal, be it, chips, stir fry or even a risotto. Once again, as with the other Tefal models, only one spoonful of oil is needed to coat the food prior to cooking making it far more healthier than deep frying. The lid is transparent so you can easily keep an eye on your food as it cooks and removable for cleaning. The ActiFry 2 in 1 has an LCD timer display with an automatic cut-off. The model is large enough to serve up to 6 people so is an ideal choice for large families. The parts are dishwasher friendly so cleaning the Tefal 2 in 1 is easy and finally there’s a getting started recipe book included. This is a large air fryer and the 3rd Tefal model in the line up. 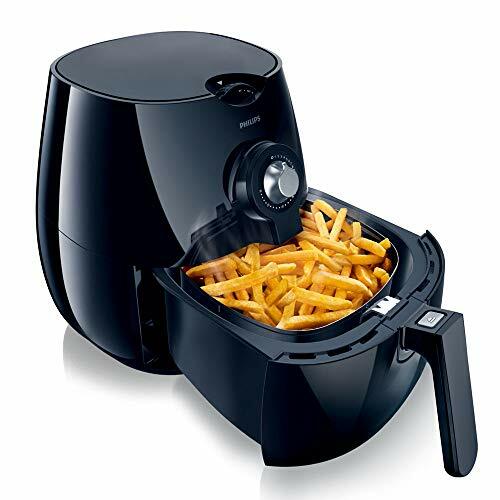 With its huge 1.5KG capacity, this extra large fryer is ideal for large families (up to six people) with big appetites. Not only is it larger, it’s also faster than the Tefal 1KG model, cooking up to 30 per cent faster. When you cook with 100 times less oil, the health benefits of doing so are obvious. This is what you can do with this low fat express – just one spoonful of oil is required for 1.5KG of chips, making your food substantially more healthier. This Tefal model is available in two colours – black or white, so pick whichever will suit your kitchen colour scheme best. You get a free recipe book to help you get started. There’s also an Tefal downloadable app for even more recipes and tips. As you’d expect, the model’s removable parts are dishwasher safe so cleaning is easy. Please note the fryer is shipped in frustration free packaging. Read our full review of this TEFAL X-Large ActiFry here. 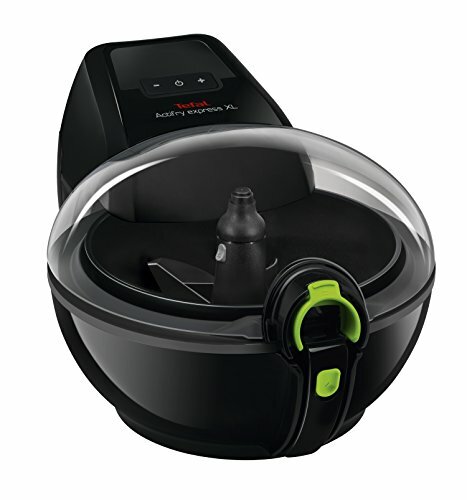 The Tefal ActiFry has a versatile range of features, is easy to clean and great value. When there are five million households in the world using a Tefal ActiFry, it’s no surprise to see this in our top ten list. Introduced to the UK in 2007, it’s been used to cook healthy, low fat meals in homes up and down the country. A common misconception with low fat cookers is that you can only cook chips in them. Wrong! 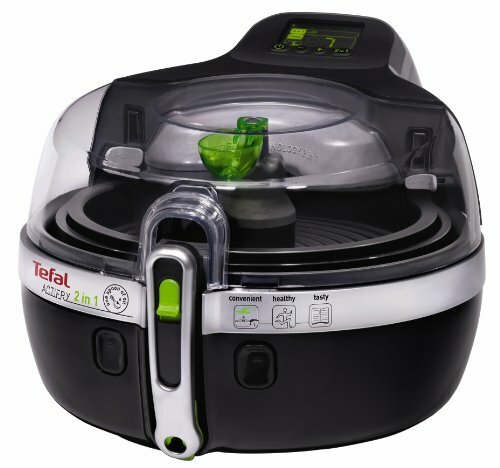 The Tefal ActiFry, along with all of the other fryers featured here can be used to cook a multitude of meals including curries, casseroles and roast dinners. What makes this fryer stand out as our top choice is the patented technology around the paddle and hot air system meaning thoroughly cooked food every time. 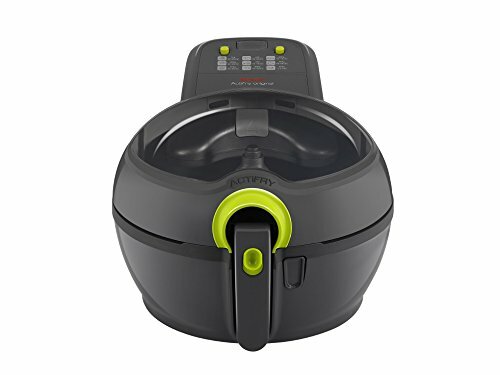 If you’re short on time, you’ll love the ActiFry’s simple and easy clean system – just added your ingredients, and of course a spoon of oil and leave it to cook you a delicious meal, every time. The lid, bowl and paddle are dishwasher safe and the remaining parts can be cleaned with a damp cloth with ease. To top it off, it also comes with a free recipe book, so if you’re new to this type of cooking then that will help you get started in no time! Read our full review of the TEFAL ActiFry Plus here. 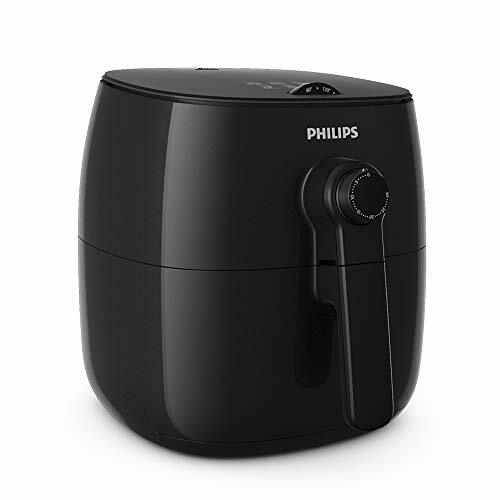 The team at Philips have done a cracking job in producing the HD9220/20 Airfryer. This is one of the smaller capacity fryers we have reviewed but depending on your requirements, this might be the ideal choice for you. With its patented Rapid Air Technology, the Philips HD9220/20 can cook fries with 23% fewer calories than those cooked in a conventional deep fat fryer – an important consideration if you want to follow a calorie controlled diet. It comes with a fully adjustable temperature control as well as a timer, which also has pre-set cooking times and an auto-off setting. There’s also an audible sound informing you cooking has completed. 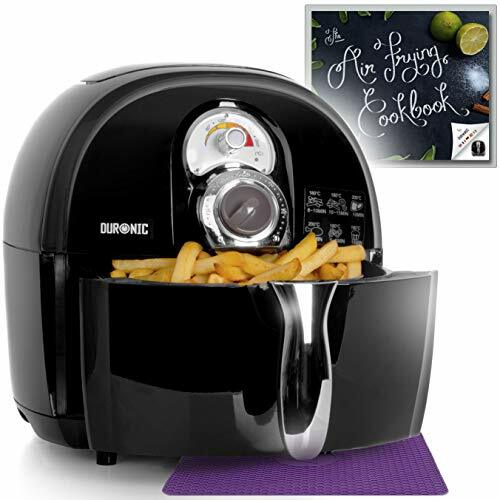 Like other appliances reviewed here, this also comes with a recipe booklet to help quickly get you started and cooking – the low fat way. Unlike other fryers on the market, there is no transparent lid to this machine, so you can’t check on your food without removing the tray, but this is a minor point we thought we should mention. Lastly, something worth pointing out is the HD9220/20 is delivered in frustration free packaging which means there will be minimum package waste for you to dispose of when it arrives. Read our full review of the Philips HD9220/20 here. Here we have a fryer by another well known brand, Russell Hobbs. This model comes in white and black and will suit most kitchen counters, blending in with other appliances. The Purify uses circulating hot air to ensure food is cooked thoroughly and evenly, giving a crispy finish to family favourites such as chips and chicken nuggets. As this is a closed fryer, odours and vapours are greatly reduced. Whether it’s baking or roasting, the Purify will do both and although there’s no rotating paddle with this model, all that is required is a quick shake of the cooking basket, using the easy to hold handle. Cooking different foods at the same time is possible too, with the food separator. There’s a 2 litre capacity and comes with a cooking temperature of up to 200° C. There’s no preset timers, but a manual 60 minute timer with auto cut-off. There’s no need to use any oil of fat – it’s down to your personal preference on healthiness and taste. Washing up is easy as the cooking basket is dishwasher safe. 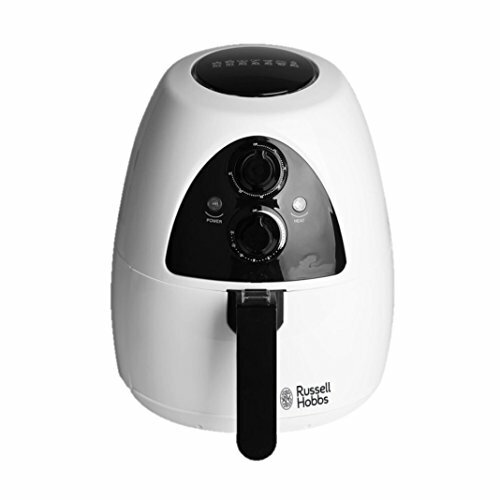 Read our full review of the Russell Hobbs 20810 here. The GOURMETmaxx is a new entry in our line-up of low fat fryers. It’s German designed and engineered so you can expect a very good quality fryer. It uses a basket and handle design, with no viewing window. In looks, it’s very similar to the Phillips HD9220 model, with a sleek, glossy black finish which compliment most kitchen finishes. Read the full review here.